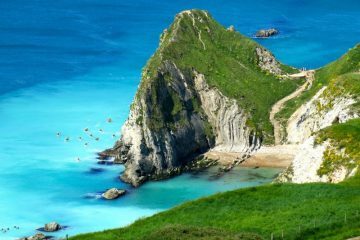 You may think that the tiny smattering of islands strewn near the southernmost tip of South America have little to offer in terms of hiking, but that’s where you’d be wrong. 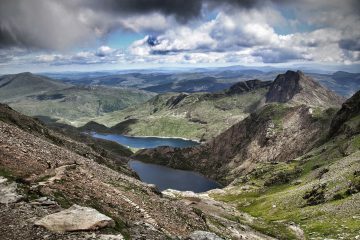 An abundance of endemic wildlife, sensational scenery and a beautifully unpolluted shore and skyline are just waiting to be discovered in this remote and wild adventure playground. 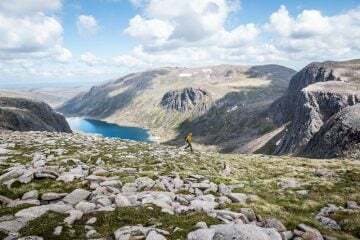 The population on the Falklands is so sparse that you’re unlikely to see another soul on the trails, which is a true rarity in an age where there is precious little left to be discovered. 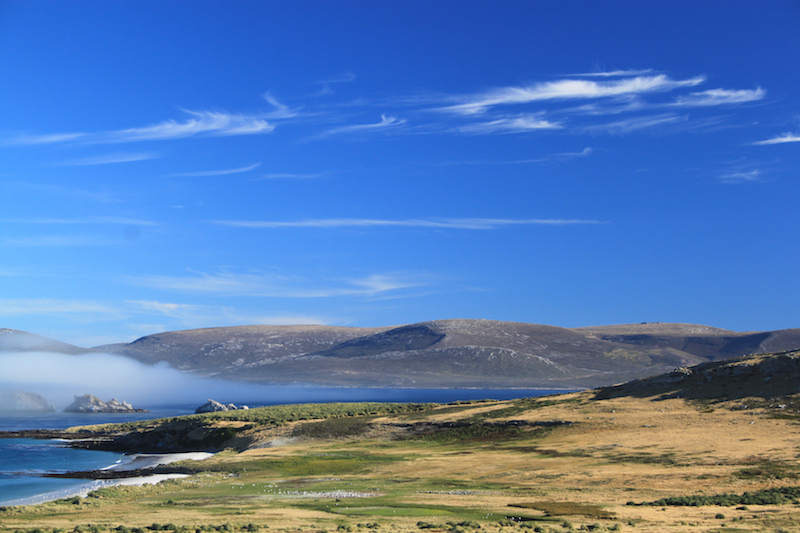 Tick off the highest point in the Falklands with a hike up Mount Usborne (706m), found on East Falkland separating the old British army landing site of San Carlos Water from the capital, Stanley, which also happens to be the only town of any consequence. 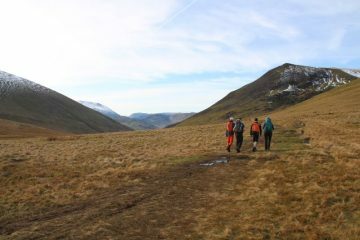 You’ll likely have to forge your own path to the top using GPS systems to find the summit, which boasts views extending across the Falkland Sound to the snow-dusted Mount Maria. 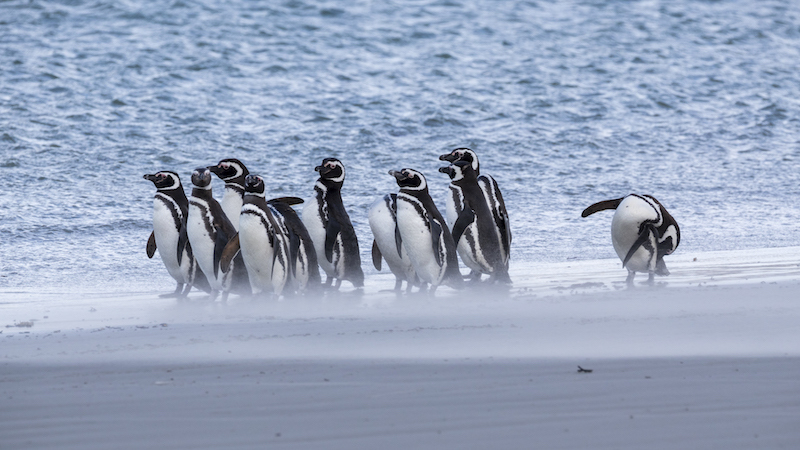 Wildlife lovers are in for a treat with a hike around Gypsy Cove, part of the Cape Pembroke peninsula on East Falkland, and also the place where Magellanic penguins breed and make their nests. Take a shuttle from Stanley (it’s about four miles away) and then head out on foot from Yorke Bay to Gypsy Cove, continuing on round the bay past Tussac and Engineer Point to Whalebone Cove, where you’ll find the rusty remains of Lady Elizabeth, wrecked here in 1936. She originally arrived in the Falklands on 13 March 1913 under a Norwegian flag, but struck the Uraine rock at the entrance to the Berkeley Sound and sustained irreparable damage. She then served as a floating warehouse until 17 February 1936, when she broke from her moorings and drifted to her current location. A sweep of white sand, dolphins dancing offshore, and penguins huddled on the beach all make this a coastal hike you won’t forget in a hurry. 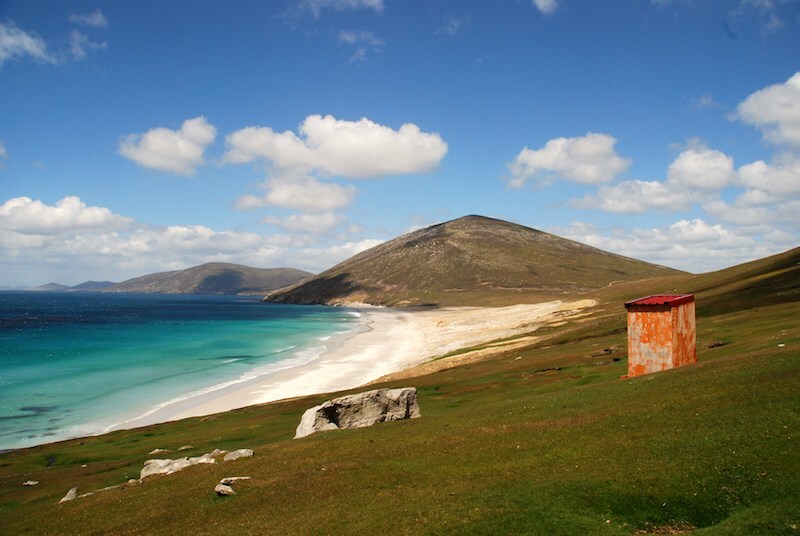 Found to the north west of West Falkland and named for the HMS Carcass which visited in the late 18th century, Carcass Island is a treasure chest of beautiful beaches, unique wildlife and rolling countryside. The whole island is a managed sheep and cattle farm and is also an important site for unusual species of bird, thanks to a distinct lack of cats and other predators. Head to the highest point on Mount Byung (213m) or simply explore the many tracks and trails to deserted coves, dramatic cliff points and vast open plains. You can also take the ferry over to West Island to explore further, a fantastic opportunity to spot dolphins and other marine life. Another of the spectacular islands found surrounding West Falkland, Saunders Island is known for its penguin and albatross colonies, which can be spotted on a hike along the spine of the north part of the island from Rookery Mountain (421m) in the east, through the narrow island’s sandy ‘neck’ and back up again to Mount Harston (436m) in the west. It’s a long and challenging hike that will reward you with spectacular views of the azure Atlantic Ocean to your right and superb views of neighbouring islands to the left. 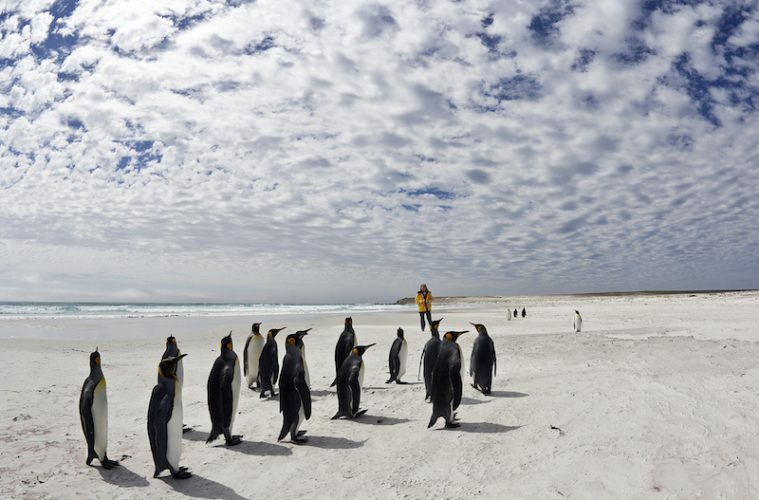 After summiting Rookery and, subsequently, Mount Richards and it’s satellites, you’ll reach the sandy isthmus known as the neck, regularly inhabited by hordes of penguins; Magellanic, gentoo and king penguins can all be sighted on this remote stretch of sand. Keep an eye out for the rare black-browed albatross on your travels. 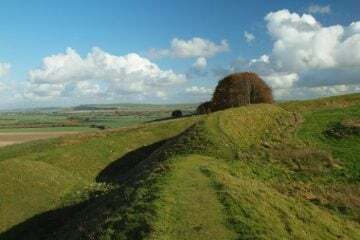 Once you reach the neck, you can choose to continue on up Mount Harston for the final summit or turn back the way you came. This stunning series of sculptures is accessible from Stanley and takes a full day’s hiking to explore. 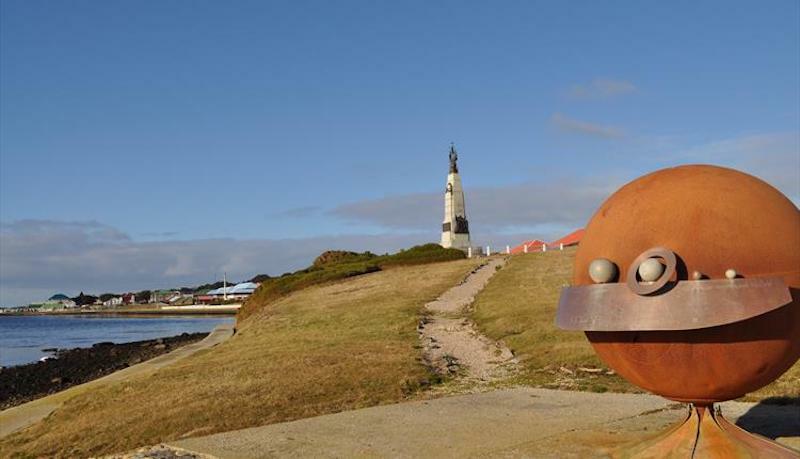 Designed and constructed by local artist Rob Yssel from recycled local materials, this 1:1 billion scale model of the solar system is completely unique to the Falklands. You will begin your hike at the sun sculpture and progress out of town, with the sun sculpture in sight at all times. A pleasant day hike paired with an impressive and creative recreation of the solar system makes for an unusual and thought-provoking hike. As a British overseas territory, despite being so far away it’s surprisingly easy to get to the Falklands, with flights leaving from Oxfordshire (with a brief refuelling stop in Cape Verde) twice weekly, operated by the RAF Airbridge. You can also fly via South America, with weekly departures from Santiago de Chile. Alternatively, cruise vessels regularly visit the islands; you’ll find everything from gigantic luxury liners on a tour of South America to small expedition vessels headed for Antarctica.